A 35-year-old, right-handed male presented to the emergency department with complaint of right upper arm pain. He was a member of an amateur baseball team; just prior to arrival he threw a ball and immediately felt a pop and sharp pain in his right upper arm. Since that time, he had been unable to move his arm due to pain. He reported no prior injury to the arm but did state that over the last several weeks he had been having an ache in that arm. He was otherwise healthy, took no medications, denied weakness, numbness and tingling in his right arm. He was a non-smoker and an occasional drinker. He used no drugs. Physical exam was non-focal except for the right upper extremity. His right upper arm was swollen and tender to the touch. He had decreased range of motion in his elbow and his shoulder secondary to the pain. He had an obvious deformity of the right bicep region. Distally the patient was neurovascularly intact with normal range of motion and light touch sensation intact in the wrist and hand. He had a 2+ radial pulse and capillary refill was less than 3 seconds. The patient was given pain medication and sent for an x-ray of his right humerus. The x-ray demonstrated a displaced spiral fracture of the humerus (fig 1). The patient was placed in a coaptation splint and prior to discharge, reexamination revealed no evidence of radial nerve palsy or radial artery injury. The patient followed up with the orthopedic doctor on-call and underwent open reduction and internal fixation of his injury within 1 week (fig 2). 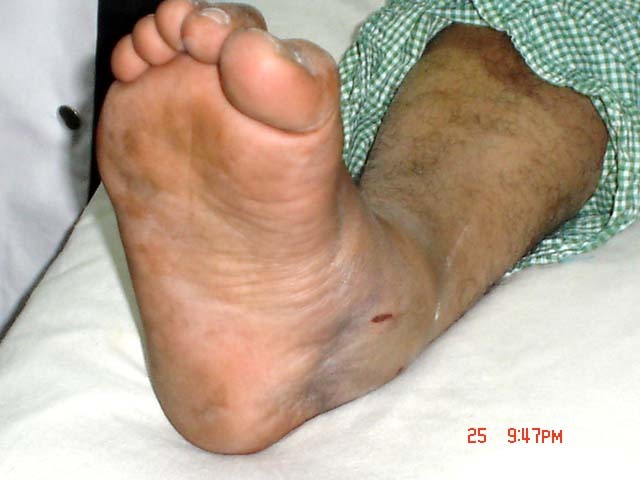 This patient's presentation is consistent with a well described, but rarely observed phenomenon known as a 'Thrower's Fracture.' First reported in 1930 , cases have been reportedly related to everything from a baseball [2, 3], to a cricket ball , to a dodge ball , and hand grenades . As with our patient, many patients who present with this injury are amateur athletes who have likely not developed adequate cortical strength of their bones as compared to professional athletes . The injury is often preceded by several weeks to months of aching in the region of the humerus, which is thought to represent a stress fracture [2, 4, 8]. The complexity of the throwing motion and related transfer of forces, results in significant torque being applied to the humeral shaft, leading to a fracture, most commonly in the mid to distal third of the diaphysis. These patients can have similar complications to any mid-shaft, spiral humeral fracture including damage to the radial artery and radial nerve [9, 10]. In these cases, given the active nature of these athletes, and if underlying complications have occurred, surgeons may elect to repair this injury surgically [2, 4, 10], though this is not always necessary given the fracture morphology. Wilmoth, C., Recurrent fracture of the humerus due to sudden extreme muscular action. Journal of Bone and Joint Surgery, 1930. 12: p. 168-169. Miller, A., C.C. Dodson, and A.M. Ilyas, Thrower's fracture of the humerus. Orthop Clin North Am, 2014. 45(4): p. 565-9. 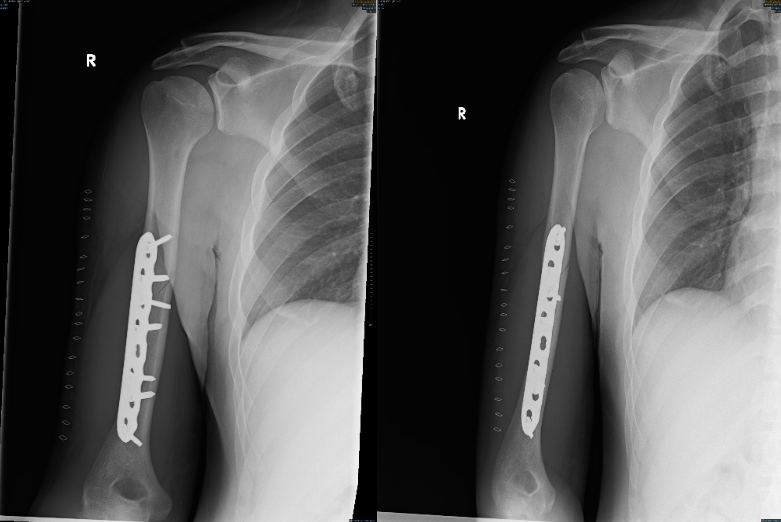 Perez, A.Z., C.; Atia, H., Thrower's fracture of the humerus: An otherwise healthy 29-year-old man presented for evaluation of acute onset of severe right arm pain. Emergency Medicine, 2016. 48(5): p. 221-222. Evans, P.A., et al., Thrower's fracture: a comparison of two presentations of a rare fracture. J Accid Emerg Med, 1995. 12(3): p. 222-4. Colapinto, M.N., E.H. Schemitsch, and L. Wu, Ball-thrower's fracture of the humerus. CMAJ, 2006. 175(1): p. 31. Chao, S.L., M. Miller, and S.W. Teng, A mechanism of spiral fracture of the humerus: a report of 129 cases following the throwing of hand grenades. J Trauma, 1971. 11(7): p. 602-5. Ogawa, K. and A. Yoshida, Throwing fracture of the humeral shaft. An analysis of 90 patients. Am J Sports Med, 1998. 26(2): p. 242-6. Reed, W.J. and R.W. Mueller, Spiral fracture of the humerus in a ball thrower. Am J Emerg Med, 1998. 16(3): p. 306-8. Curtin, P., C. Taylor, and J. Rice, Thrower's fracture of the humerus with radial nerve palsy: an unfamiliar softball injury. Br J Sports Med, 2005. 39(11): p. e40. Bontempo, E. and S.L. Trager, Ball thrower's fracture of the humerus associated with radial nerve palsy. Orthopedics, 1996. 19(6): p. 537-40.